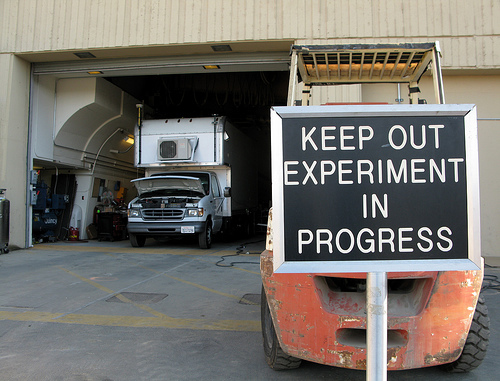 Anyone can run an experiment — just go try something and see what happens. That’s how I approach chili. Over time, I suspect that my judgment about what works and what doesn’t is probably getting better. And for family meals, that is good enough. If I do something disastrous, the family can temporarily survive on mac and cheese. But you should demand much more from the innovators in your company, because their experiments will cost more and they take longer. Trimble than goes on to claim that innovators should be clear, in advance, exactly what experiment they are going to run and on the outset have answers to questions like “What do they expect will happen and why?” and “What are the assumptions that support their predictions?”. He then goes on to talk about how innovators should actually learn from this experimentation approach. All sounds well and good and I actually agree with most of what Trimble writes on learning after (and during) the experiments. But the claim that all innovators should be clear, in advance, about what is the experiment and what kind of results they expect, to me, seems to be missing at least part of the point. While there is a place for calculated assumptions based experiment I think a point should also be made for experimenting just for the sake of experimenting. Parts of innovation are in essence, delving into the unknown. There is a difference between incremental innovation, where your experiment is marginal and partly predictable and radical innovation, where you come up with something so different, no one has actually though about before. If you can predict what will happen, you are not really innovating in the radical sense of the word. And for radical innovation to occur, part of the process is experimenting without understanding exactly what is going to happen. Think about new products and services. My fear is that just by making ourselves think about what we expect to happen we confine ourselves to our current knowledge. If we think a new product is not going to work or that there will not be demand for a new service, we will be less inclined to waste time and money to try it out. But we don’t really know what is going to work. People themselves don’t always know what they want. Some products and services succeed even though everybody thought it is a terrible idea and that it wouldn’t work. While the framework Trimble suggest is valid, I just want to offer this one suggestion. Leave room for experimenting for the sake of experimenting; for trying something that we are sure is not going to work or that we are totally unable to predict its outcomes. Let’s see what happens. « Are you standing out as a manager?